If you haven't yet, you should go check out my guest post at Wordsmithonia on my favorite fictional character. I chose to talk about Suzy Turquoise Blue, heroine and auxiliary character extraordinaire from Garth Nix's Keys to the Kingdom series. 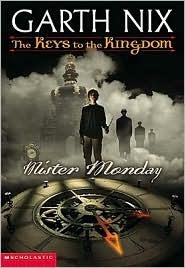 The first of seven books (and an introduction to Suzy) was Mister Monday, which I reviewed here. Oh, and happy Friday! I'm glad you shared, otherwise I would have never thought of picking the book up. Great giveaway - and congratulations on having so many followers!